This entry was posted in Miscellaneous, Online Tools, Piontkowski / Pointkouski, Polish Records, Polish Towns by Donna Pointkouski. Bookmark the permalink. Donna – Thank you so much for this info! Of course I didn’t find everyone I was looking for (Why can’t that happen just once? 😉 ), but I did find some of the family and gained some new information. Most interestingly my great-grandfather Leonard Szerejko may have been married before he married my great-grandmother Jozefa. 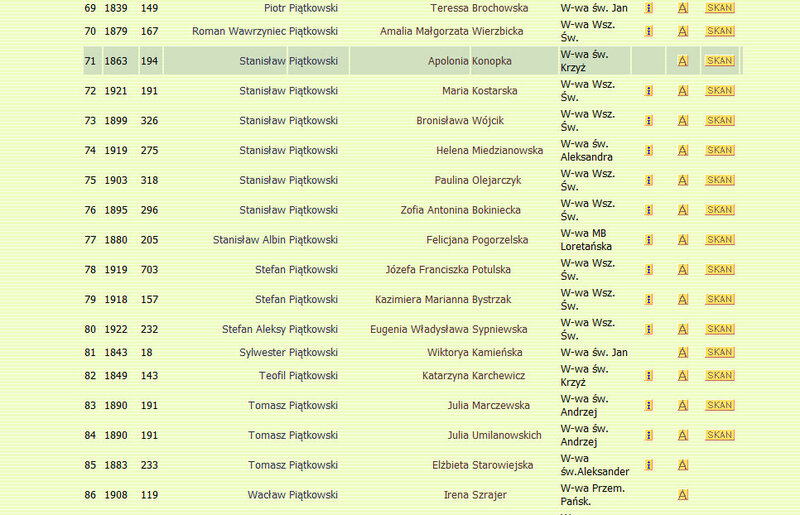 I was also able to track additional family members back to Suwalki which is where we suspect the family originates. Thanks again! Thanks so much for this information and explaining how to read the marriage information, thanks to a translation site I was able to figure out how to search and found my great great grandfather and grandmother which verified that she was indeed the correct name for the wife. Loved it!! I’m glad you found the site to be useful! I followed the link in your “K” post of July 22, 2012 and then the link to this post and on to Geneteka. I found the weddings of my great-grandfather and great-grandmother and of his brother, too! Also a baptism for one of their daughters. This gives me the names of all their parents. What a thrill to see that my great-great-grandmother’s name was Marianna. That’s awesome! I’m so happy you found records for your family! Where were they from? They were in Warsaw-Palasz. Wielechowska, Baranowska, Minasiewicz are the names. This is the best info I have found for a long time! This is Amazing! Thank you so much! I’ve been working on my family history for a few years now. My mother’s family is from Poland and I have not been able to get much information about them because Polish records are harder to find. I appreciate this so much. Thank you for posting! Hi Donna, I tried using the Geneteka site, but for my surname all I get is an indication of the number of records, but not a summary of the records themselves. Have you seen this? Why would this happen? Thank you so much for writing this blog post. I have been researching my family tree since 1999, mostly on my mother’s side because she goes back well into the 1600 here in the United States. I’ve been hoping to do more on my father’s Polish ancestry, but haven’t had much luck…until now. I did as your post suggests and went to Indeks Indesków first, selected the province where my family was from (Podkarpackie), and discovered Mike Burger’s site that has birth and marriage records for Dobrynin from the mid-1790s until the early 1910s. Low and behold, I found my great-grandfather Kasimierz Muniak (who was born in 1880 and immigrated here in the early 1900s) as well has his parents, grandparents, great-grandparents, and even the name of one great-grandparent. I didn’t even now he came from Dobrynin and I only had his parents names (no dates and no other names). Now I have a wealth of information and have been able to go back several more generations. Thank you, thank you, thank you! I can’t tell you how tickled pink I am right now. That’s awesome, Louise! I’m so happy for you and glad that I helped you find it. 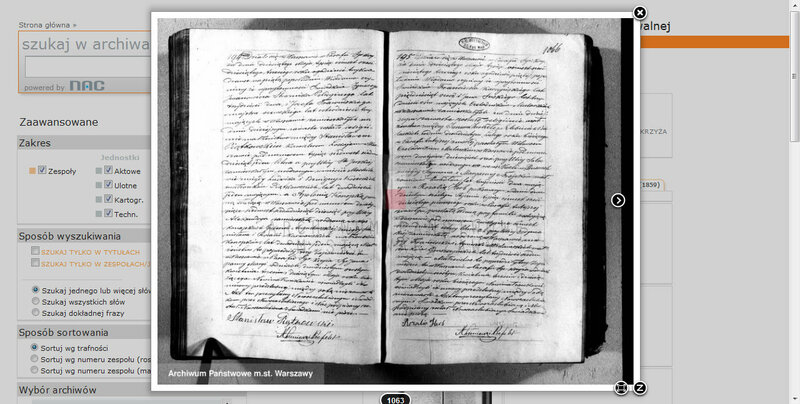 I’m due to write a new post soon since the Polish Archives have digitized over 7 million records! Best of luck in your research! I found no information from Tarnow church archives or Boleslaw /malopolskie parish. Thanks for this valuable information. I”ve been trying to find more about several lines in my family and discovered my great-grandparents (Jacob Kaminski and Franciska Ciszewska) via one of the links you provided. Such a thrill to have all of the pieces connect, including my GGM’s maiden name which didn’t appear in many of the American records I found (the closest was “Czecheski”). I confirmed that their hometown was Redgoszcz in Lekno parish and now have a chance to find out more about them! Many, many thanks! Loved reading your blog. I am trying to find my great grandparents in Poland. Either their marriage or their births. I’d be happy with one! So difficult! I’m entirely frustrated because my great grandfather’s name is not the same! It is Kofton, which is not Polish, though he claims to have been born in Warsaw. I know one day I will find him. I am trying to find his wife, Helen Pawlowski, which is not easy. Thanks for your inspiration and links! I will keep trying. I was very intrigued and impressed with your site. Took me a long time to find one of this caliber. The problem I am facing is finding information pertaining to my dad’s family tree. As you can no doubt tell, I am having a very difficult time. My dad gave me HIS dad’s grade one report card : it is dated october 1st,1899 in KOMAROWIE , province of Galicia (west) . His name is Michal Waszczuk. His dad’s name is Julian Waszczuk ( mother is Catherine). Any advice you could give me would be greatly appreciated. I went through your site and found a few waszczuk’s but am unsure if they are related because the areas are not familiar. Galicia covers a huge area and I haven’t been able to find the town of KOMAROWIE. Looking foward to hearing from you or anyone else for help. Love your site….am learning alot about Polish history from reading what you’ve put down. You can email me at myselfeh@sasktel.net I am from Saskatchewan, Canada. ps: school year was 1906/07, single grade Folk School Grade one level one. The -ie suffix denotes locative case, so it is likely the town is actually called Komarow (you can find it on a Google search). “Komarowie” would be used, for example, to a school of that town. There are tons of cases in Polish that we English speakers aren’t used to. See http://www.jewishgen.org/infofiles/poland/pronunciationguide.pdf for a good explanation. According to a quick Google search the town you are looking for is now in Ukraine. Geneteka doesn’t have much for Ukraine at all. Try Matthew Bielawa’s site, http://www.halgal.com for info on where to look. I’m not familiar with that area. I am looking for death certificate the name was Janina Stefania Semenowicz, meiden maiden name was Demkowicz, she was lived in: 04-119 Warsaw 44 Budrysow 11 A #34 Please help me . Hi, Donna – I have been researching my family for a couple of years. My grandfather and his siblings, named Brockman, were all born in Poland, between 1864 and 1874. They were born in the area around Kalisx, Siedradz, Lodzkie, and Blaszki. I can’t find any records of them on Ancestry, only from family records. The frustrating problem comes from their father, my great grandfather. I can only find a passing reference to a man with a name shown as Samuel J. (David) (Kalman) Brockman. He was married to a woman named Rosa. I’m not even sure where the Kalman name came from. Limited family records show that each of his children gave their parents different names at different times. I am very frustrated at my inability to even know where to begin. I had pretty much given up until I came across your site. Any suggestions or assistance you might be able to provide would be most appreciated. Has anyone access to church and or city family records in Zirardow circa 1900? Geneteka is a gold mine! I’ve found several scans and many ancestors listed – I’ll have to contact the archives, but now I know exactly where the records are! Wiring money is so expensive and my ancestors are listed in a few different archives. Nevertheless, it is a fabulous site and once you get the hang of how to search, the search options are excellent. I’d say it’s the best site for Polish genealogy that I’m aware of. Thank you for the instructions to use this site. Yes, it is a wonderful site that I found thanks to Donna’s post, too. I found marriage and birth documents for my Grandparents and Great Grandparents. Unfortunately, I have still not found any one to translate them for me. So, if anyone ever reads this and knows of a reliable translator, please, post it here. Could you please tell me what provinces of Letowice, Goslawice and Wierzchoslawice, Poland. I am researching the Bryl Family Tree. Father was Mikolay Bryl and Mother Magdalena Wolnik Bryl (Goslawice) I am also doing research on the family of Stanislaw Setlak and Anna Pecak Setlak from the village of Skrzysrow. What province would they be from? I am also trying to find relatives from Letowice with the last name Drelicharz. Im not familiar with any of those towns but I find if you try Google and Wikipedia you can discover their location and current province rather quickly. You can also use http://www.jewishgen.org/Communities/LocTown.asp the Communities database to find every town in Europe…especially useful if you’re not sure how to spell it and your Google search comes up blank. Does anyone know where to find wills in Poland 1900-1920. It would have been the voiviodship Stanisławow, area Horodenka, parish Czernelica. Interesting site 🙂 Can anyone tell me please how I obtain a birth certificate for someone born in Szesakowa in 1926, who would I need to contact? My father Waclaw Kowalewski was born on the 7 Sept 1926 in Szesakowa which I believe is now Szczakowav. He was captured in 1943 and spent time in Dachau Concentration Camp before being liberated and eventually moving to Australia in 1950. Hi everyone! I’ve trying to get my family’s Polish citizenship confirmed. My grandfather was born in Warsaw in 1930, but I can’t find any records for him. He died in 1998, but I’ve found his Scouting and Guiding Association ID card from Zeran in Warsaw, and I found his father’s baptism record from 1905 in Wola parish, Warsaw. Does anyone know who I should contact? My grandmother was born in Nowojelnia which is now part of Belarus and called Navajeĺnia. I can’t find any records for them at all until they arrived in the US zone in Germany after world war 2. Thanks to you all for the info! My grandfather was born on January 10,1890 in Bartniki in Suwalki Poland.How can i get a copy of his birth certificate. Hi ,can anyone help me find some records of my great grandparents and also their parents? No luck for me on any of these sites. I do have the day my great grandparents were married.also I have their parents names. I have a marriage certificate but it’s in polish and I can’t read it. I’ve started a search on my polish GGM in memory of my mother who passed away. Her dream was to find out more about her GM. With a friend’s help I discovered she was married in Poland before she imigrated to Brazil. I want to find out if her polish husband stayed/died in Poland or came with her to Brazil. She had 2 children in Brazil with a spanish immigrant. Could you tell me how can I find the information about her first husband? I just found your site and I was excited about all the information you provide. What town in Poland and what timeframe? If you belong to Facebook, join the Polish Genealogy group. People are always doing free translations to help. See if the Polish Archives has the town’s records online at searcharchives.pl Otherwise, find a Polish genealogy forum (Facebook, Ancestry, genealodzy.pl) and ask your question there. Thank you for this wonderful information. While, I stumbled upon the site you mention and found my way around with the help of a Polish/English online translation (for the info when you hover over the “i” icon, which isn’t in English), when I click “skan”, I’m receive the message, “You don\t have access to this directory”. However, I randomly clicked on another “skan” and it opened. Does anyone know why I am getting this message (it’s my Grandmother’s birth record and hooray, I now know the name of my Great-Grandmother). Just started searching online seriously a little over a year ago, so I’m quite a newbie. Thanks! Donna I can’t believe!! We have The same surname but my great-grandfather – also Stanislaw married Stephania or Stefania. I’m trying so hard for so long to know about my polish heritage. My grandfather’s name was Jan and I know he had a sister named Anna. She died in 1989 three days before I arrived Warsawa to meet her. Can You help me somehow? You might want to try the forum on PolishOrigins.com or the Facebook group on Polish Genealogy. Thank you for your clear directions on how to use Genetka. I have found my grandmother’s birth record (Chelchowska in Krasnosielc) and hope to make more discoveries in the near future. Great-Grandfather Louis Raciborski born May 1892-1896 Warsaw, Russia (from the naturalization paperwork). How do I find family when all I have is my grandma first and last name that all. I know I’m polish but nothing else. You’re not going to find anything until you do some research in the US to determine where in Poland she came from. A good how-to book for Polish genealogy is “Going Home” by Jonathan Shea. Geneteka is a fantastic data base site. I am from Australia and was able to find my 93 year old fathers family background from this site. I knew the village he was born in and Geneteka will sort people with a given name in say the Lodz province. Poland has 18 Archdiocese provinces and many times after the sort I used all the provinces to get my information. Took time but successful. Donna I first came across your site several months ago while trying to trace my mother’s family but I’m afraid I gave up. Then today while surfing I ended up at your site again and gave the Geneteka site another try. Armed with a polish – english translation page running in the background I went looking for my Ksiazek relatives in the Minsk Maz area. My mother is gone now. She was the youngest of her siblings by 10 years, was snatched up in the occupation of 1939, liberated in 1945 and went to England and unfortunately she spoke little of her family after the war. I was able to drag out the names of most of her siblings while she was here and today thanks to you I was able to find and verify most of what she told me. It’s not an easy search when you don’t speak or understand the language but you have been a tremendous help today.